I pride myself on my sheer manliness just as much as the next comicbook collector, but a while ago I ran into a problem that had me Googling if testosterone supplements were over the counter. It was during a very manly round of gaming when I decided that, amongst my roster of very manly MUGEN fighting characters, it would be funny to download and add this little white bunny character I found online. Wanting to see how it worked, I set up an auto match for it against a mirror copy. The round started and the copy bunny approached the first little bunny and began pushing and flopping its ears on it, while the other tried to escape. It instantly became the most heartwrenching thing I had ever seen on my computer. The thing even squeaked when it fell down. I quickly forfeit the round. Okay, maybe I just didn’t like two cute things fighting each other 1. 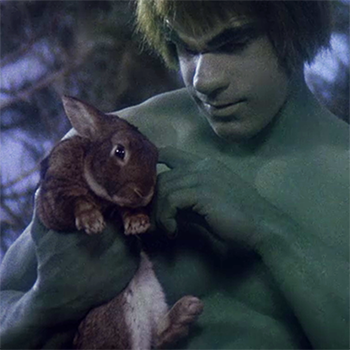 I proceeded to load up the Hulk to fight the bunny. Surely that would be funny. Two button presses later and another forfeit. After walking off the mental trauma I just went through – and fuming at losing yet another round to a little fuzzy bunny 2 – I decided to explore just how severe my “takes everything too literally” disease was, and hopefully find a cutoff point 3. After downloading whatever cute characters I could find, it was about the time I realized I couldn’t even bring myself to punch WakuWaku7’s Maruru in the face that I realized I had a major strategic weakness against anything that made a dog-yelp sound when kicked, which would cripple me for life 4. I play fighting games to beat up strong, challenging fighters; what *possible* reason could you have to insert Yoshi, Okami’s Chibiterasu, or any of the cast of Pokemon into the ring other than to advance research in Nazi science? Seriously, where did these characters even come from in the first place? What on earth kind of game would be insane enough to use cutesy ‘pocket’ characters as the fighters? 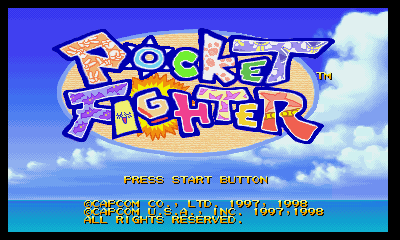 Surely the most horrible game ever made would be a pocket… fighter..
Pocket Fighter. The most stupidly cute fighter I ever played in my life. It has charming little characters I’d never want Kano or Sub Zero to find out about. How was it I was able to beat baby Chun Li into a KO back in the day? It turns out the ‘beatings’ consisted of slapping her with a penguin while she responded by giving me a love note that made me so flustered I exploded. At last, the perfect answer – fight fire with fire, the cute with the even more cute 5. My cure, while not 100% manly, had been found. Beware fuzzy bunny. Next time I’ll be ready. Cucumber Chop! !